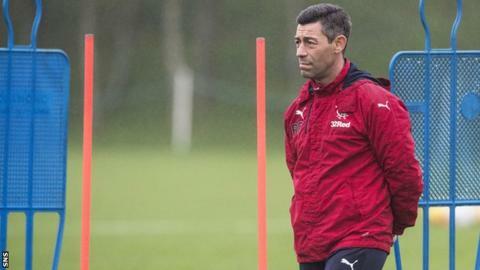 Manager Pedro Caixinha says his Rangers players embarrassed him and the club in the 2-0 League Cup semi-final defeat by Motherwell on Sunday. Rangers' failure to reach the first domestic final of the season has put added pressure on the Portuguese. "I've told the players: 'You are embarrassing me, you are embarrassing our club, you are embarrassing our fans'," Caixinha said. "Now it is time for you to react and I'm glad we're playing on Wednesday." Caixinha's record stands at 14 wins, four draws and seven defeats since he took over from Mark Warburton in March. The Portuguese now wants the players who featured on Sunday to prove they can handle the pressure at Ibrox when they entertain Kilmarnock on Wednesday night, although injured duo Jak Alnwick and Fabio Cardoso will not be available. Asked if his players were tough enough to cope with wearing the light blue shirt, Caixinha said: "It doesn't look like that. "You have seen Fabio's face (he suffered a broken nose after seemingly being elbowed by Ryan Bowman), so I cannot count on him. "If I could pick the same XI, if they were all available, those guys who didn't do the work who really needed to do it (on Sunday), those are the ones who would start on Wednesday." A Louis Moult double won the Hampden semi-final for Motherwell and Caixinha has called on his players to help ease the pressure building on him, insisting he has spent plenty of time defending them after defeats. "Now I expect to be paid the other way around," he said. "These players pay for this club, for this badge. These players pay for me. "Now they need to prove (themselves). It is part of the past, it's been identified, it's already been discussed. Let's move the page forward. Wednesday is the next stage for them to prove it."